Demand for sustainably produced local food is rising fast: Organic food sales in the U.S. grew from $1 billion in 1990 to more than $39 billion in 2014, and local food is the hottest segment in the food industry. But supply has not kept pace. 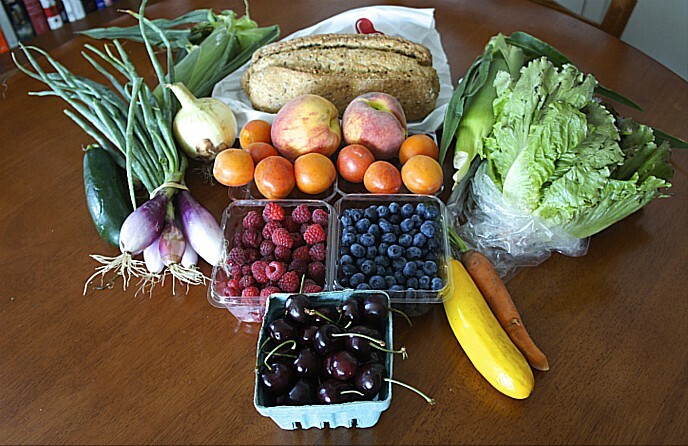 Large buyers, including supermarkets, restaurants, schools, hospitals, and other institutions are increasingly demanding sustainable local food. That’s where the Good Food Business Accelerator (GFBA) comes in. Created to address the burgeoning demand, it is a Fellows program for food and farm entrepreneurs to help them get financed, meet new customers, and scale up. 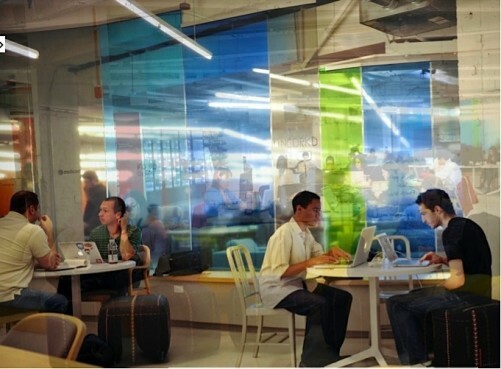 The Accelerator has set up shop at 1871, the center for innovation and entrepreneurship located in Chicago’s famous Merchandise Mart. 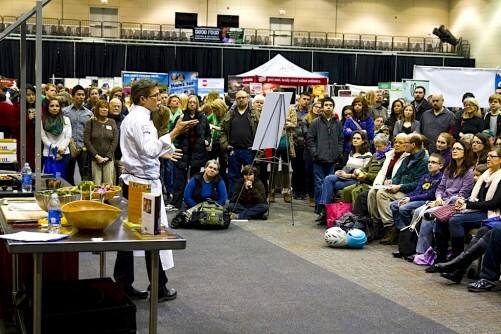 The program is operated by FamilyFarmed, a leading non-profit that supports business development in the Good Food sector (Good Food being defined as food that is local, sustainable, humane, and fair). Whole Foods Market, the nation’s largest natural foods supermarket chain, and UNFI, the nation’s leading distributor of natural and organic food, are strategic partners and funders of GBFA. The Accelerator was also the first grant of Food:Land:Opportunity — Localizing the Chicago Food Shed, an initiative of the Searle Funds at The Chicago Community Trust. And the U.S. Department of Agriculture Local Foods Promotion Program also supported the program with a $100,000 grant. The creative energy is almost palpable at 1871 — home of FamilyFarmed’s Good Food Business Accelerator — which has emerged as a major hub for entrepreneurial development in Chicago since its launch in May 2012. GFBA also has developed a strong relationship with the federal agency charged with assisting the entrepreneurial sector: the U.S. Small Business Administration (SBA). FamilyFarmed in 2014 was a winner of the SBA’s Growth Accelerator Fund competition, earning it $50,000 to help launch the Accelerator program that began last fall and is rounding out its first six-month session of mentorship for nine competitively selected entrepreneur Fellows. 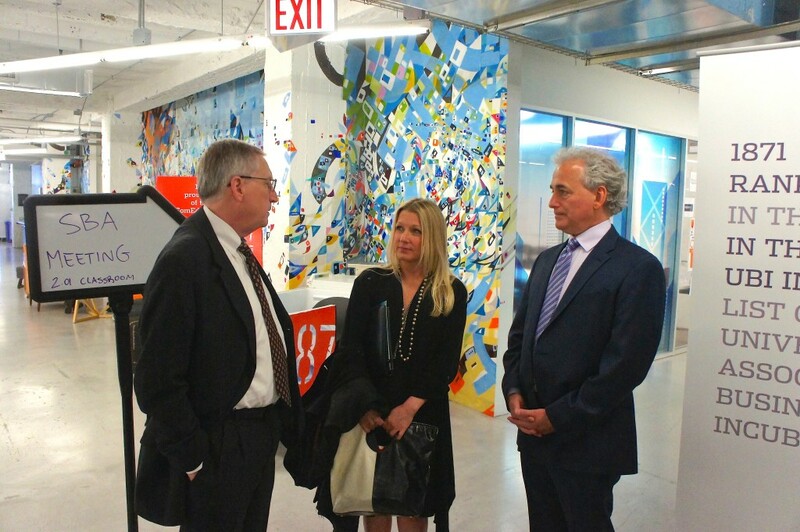 And twice, within a six-day period over the past week, leading SBA officials visited GFBA and were treated to tours of 1871 led by Howard Tullman, its CEO. They included Administrator Maria Contreras-Sweet, who heads the agency in her Cabinet-level position, and Javier Saade, SBA’s associate administrator for the Office of Investment and Innovation. They were accompanied by Regional SBA Administrator Marianne O’Brien Markowitz, who oversees the agency’s operations in the Midwest, and Bo Steiner, SBA’s director for Illinois. In addition to the Good Food Business Accelerator, 1871 also has accelerator programs working with veterans, impact businesses, women, real estate, and tech. And all of this has come together quickly: May 2 will mark the third anniversary of 1871’s opening. The timing of the SBA visits, though coincidental, was fortuitous, as the nine Fellow businesses participating in the first-year program at the Good Food Business Accelerator were preparing for their climactic event — Demo Day @ 1871 — which will take place Monday evening April 27 beginning at 6 p.m. In what may be equated to the oral exams of a college graduate school class, all of the Accelerator program’s participants will do public presentations about their businesses and their growth plans. They then will be available for conversation with attendees and investors at a reception that follows. For more information and to register to attend, please click here. Contreras-Sweet noted that Congress deemed the first year of the Growth Accelerator Fund program so satisfactory that its allocation was increased from $2.5 million to $4 million. This will enable the program to expand the number of recipients of its $50,000 grants from 50 in the current year (out of 850) applicants to 80 next year. Contreras-Sweet also mentioned the SBA’s efforts to develop business “cluster communities,” a concept with which FamilyFarmed associates itself because if its long-term efforts to connect buyers, sellers, service providers, financiers and others and help build Good Food into a dynamic market sector. A major element of this will be for SBA lenders to provide debt financing to businesses in the sector seeking loans. SBA plays a key role in this by providing loan guarantees for emerging businesses that might not otherwise qualify for bank financing. “We take this kind of energy and ecosystem that has already been very successful, and then we sort of add more of the whole of government again and kind of wrap ourselves around it. We call these ‘cluster efforts,’ and we’re trying to create little Silicon Valleys,” said Contreras-Sweet, who noted that the program’s potential has drawn matching funds from JP Morgan Chase, one of the nation’s largest banking companies. 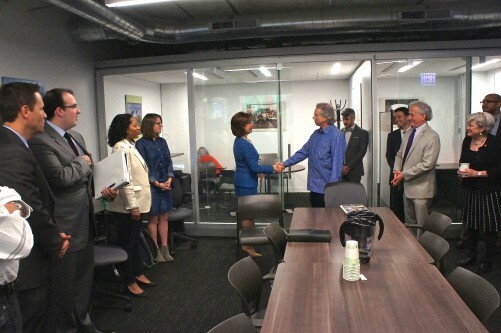 Saade, during his visit on April 22, expanded upon the details of the SBA programs that are most relevant to businesses such as the participants in the Good Food Business Accelerator. At a roundtable discussion that included most GFBA staff and Fellows, Saade elaborated upon the purpose of the Growth Accelerator Fund, which he oversees. “What’s interesting about it is that the premise of the competition, and the reason why places like 1871 and your Accelerator are so important, innovation happens almost solely at small companies,” he stated. There are specific SBA programs targeted to assisting early-stage companies. One is the Small Business Innovation Research (SBIR) grant program, which provides funding for research into areas that the government deems as national priorities. That definition typically is applied to areas such as renewable energy or technology. But Saade encouraged the Accelerator Fellows to consider whether their products fit as well. Another option is the long-standing Small Business Investment Company (SBIC) program, in which the SBA does not provide money directly to entrepreneurs, but rather provides resources to investment companies that finance small businesses through loans or, in some cases, equity capital. 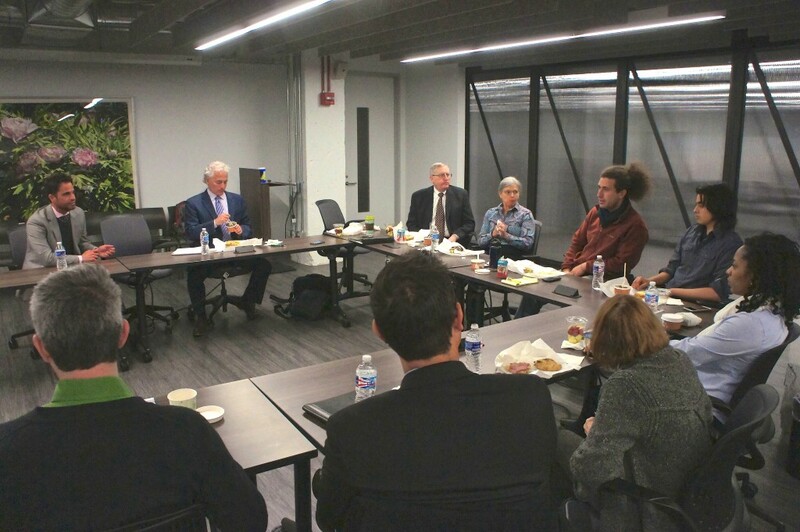 As the meeting wrapped up, Saade said he looked forward to trying the foods produced by some of the Accelerator Fellows, such as Phoenix Bean’s tofu, Living Water Farms microgreens, and the produce grown by The Urban Canopy at its rooftop, indoor, and in-ground farms on Chicago’s South Side. 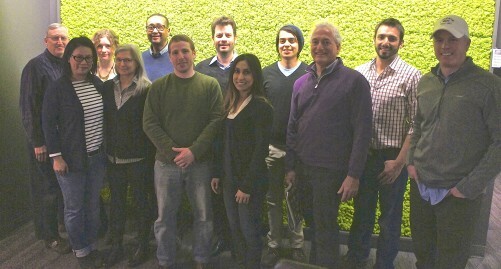 FamilyFarmed’s Slama promised him a tour of the Fellows’ businesses on his next visit to Chicago. This entry was posted in Food Artisans, Food Entrepreneurs, Good Food Business Accelerator, Good Food business development, Good Food marketing, Regional food systems, Sustainable food business investment and tagged Bo Steiner, business accelerators, FamilyFarmed, Food business accelerators, Good Food Business Accelerator, Good Food entrepreneurship, Javier Saade, Maria Contreras-Sweet, Marianne O'Brien Markowitz, SBA, U.S. Small Business Administration. Bookmark the permalink.